CRIMINAL MISCHIEF – On August 05, 2015 at 7:36 am, Patrolman Andrew Altman was dispatched to a residence on Spruce Street for a criminal mischief report. The resident reported that a window air conditioning unit was damaged by an ex-employer. DWI – On August 08, 2015 at 2:36 am, Patrolman Dennis Allen arrested and charged David Clark, 37 of Beachwood, with driving while intoxicated. The arrest was made as a result of a motor vehicle stop conducted by Patrolman Allen in the area of Pinewald Road and Anchor Avenue. The driver was transported to Beachwood Police Headquarters where he was processed and issued several motor vehicle summonses and released. DWI – On August 08, 2015 at 8:19 pm, Patrolman Thomas Prince conducted a motor vehicle stop on a vehicle in the area of Pinewald Road and Seaman Avenue. The driver, John Adams, 35 of Blackwood, NJ was arrested and charged with driving while intoxicated. The driver was transported to Beachwood Police Headquarters where he was processed and released. ARREST – On August 12, 2015, Detective Adam Griesemer arrested and charged William Cottrell, Jr., 30 from Bayville, with burglary and theft. The arrest stems from a residential burglary which was reported in July and assigned to Detective Griesemer for follow up. Information generated during the investigation lead to the arrest and charges. Cottrell was lodged in the Ocean County Jail in default of $25,000.00 bail. THEFT – On August 12, 2015 at 4:05 pm, Patrolman David Bowden was dispatched to a residence on the 1600 block of Berkeley Ave for a theft report. Upon speaking with the resident, they reported that a wallet and personal documents were stolen from the residence, which occurred sometime between August 08 and August 12. There were no signs of forced entry to the residence and the case is being followed up by Detective Griesemer. SHOPLIFTING – On August 16, 2015 at 12:57 pm, Patrolman Phil Schena was dispatched to the Rite Aid on Atlantic City Boulevard for a shoplifting report. The store manager advised that upon view the store surveillance camera they observed a male subject exit a rear door to the store with two unknown electronic items. There was no value on the items taken at the time of the report. ARREST – On August 18, 2015, Detective Daniel Altman charged Andrew Butera, 26 of Beachwood with theft as the result of an investigation into a theft report lodged by a resident in July. 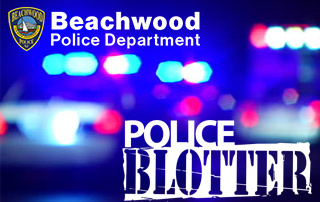 The subject was processed at Beachwood Police Headquarters and released on a summons. THEFT – On August 18, 2015 at 12:15 pm, Patrolman Adam O’Connor was dispatched to a residence on Forepeak Avenue for a landlord / tenant dispute. As a result a property dispute over a cable box a theft report was lodged after property was not returned to one of the parties involved.